energyXT by XT Software is a Virtual Instrument and a Virtual Effect Audio Plugin and an Audio Plugin Host and a Mobile Audio App. It functions as a VST Plugin. It can host VST Plugins. Streamlined interface with skinning support. Arrange/dock editor windows into multiple tabs. Transporter bar with metronome and tempo. Browser with drag & drop of Instruments, effects, samples and loops. 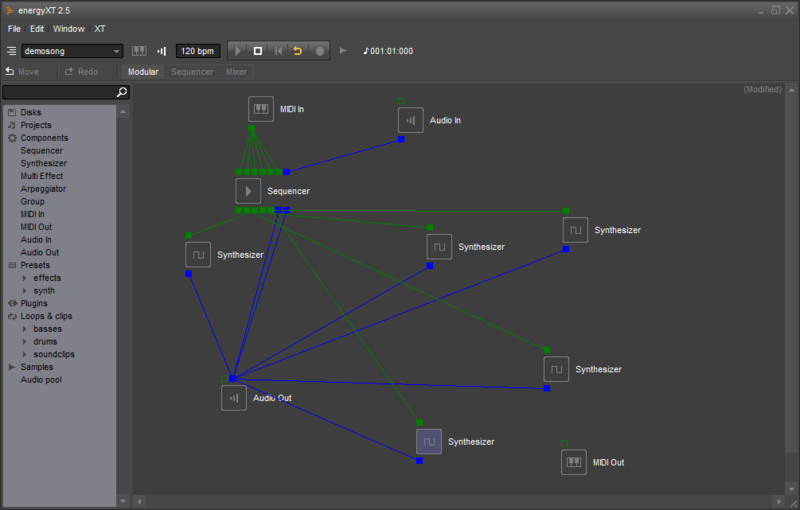 Modular component view for MIDI and audio routing. No loading time for application. Fast and easy zooming and scrolling with mouse. Define your own keyboard shortcuts. Fully control all the Mixer and VST instruments/effects parameters from your MIDI keyboard. Create your own loop library with samples and instruments. Unlimited MIDI, audio, drum and folder tracks. 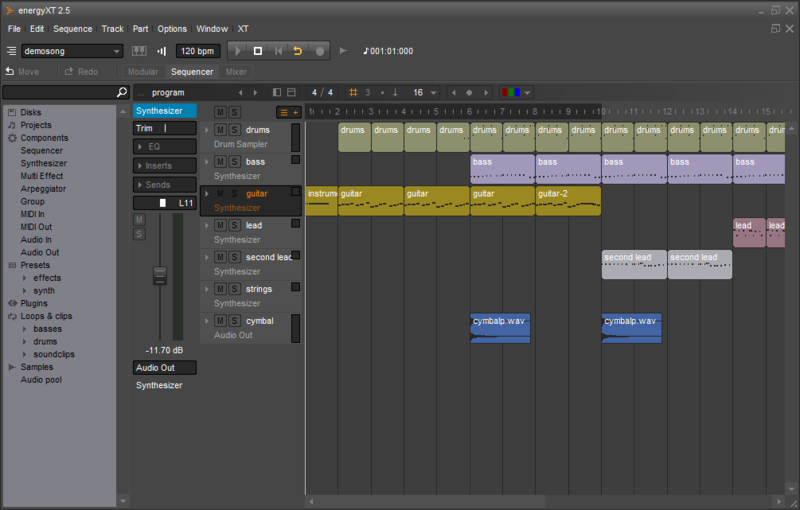 In-track editing of MIDI, audio and drum events. Track-mixer for easy mixing of selected track. Arpeggiator with random and probability on each MIDI track. Swing/shuffle control on each track. MIDI, audio and drum parts can be saved as self-containing library clips (.xtc). Parts can be ghosted (edit one part, and all other parts will be updated too). Clip-based automation of all Mixer and VST parameters. Per sample forward/reverse and 3 resample modes: normal, re-pitch and stretch. Popup-editor for MIDI and audio parts. Supports 16/24/32-bit mono/stereo wav files and REX2 (Win and Mac only). Per-channel trim, volume, pan, mute, and solo. Unlimited insert effects and send effects per channel. All parameters in the mixer can be automated from the sequencer and/or external MIDI in. Any number of group channels can be added for sub-mixing. Phase modulation synthesizer and sampler in one. Layer and split synthesized and sampled sounds. Per-program reverb and delay effects. Multi-mode filter with cutoff and resonance. 4 LFOs and 4 envelopes with 4 param destinations each. Option to edit "all" sounds at once. Available effects: reverb, delay, guitar amp, chorus/flanger, phaser, bit crusher, filter, and compressor. Any number of effects can be used in a chain. 32-bit audio engine with time-stretching/pitch-shifting algorithm from zplane development. Supports industry standard VST instruments and effects. Thread-based disk streaming and audio recording. Offline render to 16/24/32-bit mono/stereo wav files at any sample rate. Runs with ASIO, ALSA or as VST plug-in. EnergyXT is a great piece of DAW. And I say that after working with it for 7 years and having tried many others and watched yt videos of almost every other DAW widely used. The functionality in terms of number of features can be discussed, there are definitely some missing that some consider essential and are common with most leading DAWs, but there are also some that eXT users use very much but are really unique to eXT, so unknown to others. Probably the worst thing about eXT is its (public) reputation, or better, lack of it. Like, for example, this thread, the list of evaluations. The last eval here was written 10yrs+ ago. This is terrible! Not that it just seems nobody is using it, I know there are several users, but the last eval is about a dissapointment because the V2 is not an upgrade of V1. That could be called a marketing mistake from the designer but somebody should explain that here, or at least the author could call it for what it is. And unfortunately it seems that people loved V1 (I haven't tried it) and somehow got discontinued. However, the V2 evolved over time to V3 and now we have a decent and in some aspects a uniqely special DAW - IDEAL FOR AMATEURS with low budget - and not in any negative aspect of the word. Very clean interface ("less is more" logic) with all the functionality very easily accessible. Extremely low CPU usage - it literally works on any laptop or PC. Powerful and simple modular pane where you can combine more plugins in a visually clear manner. Small GUI elements (unfortunately not resizable) allow for very good use of monitor space (medium resolution monitors, laptops). 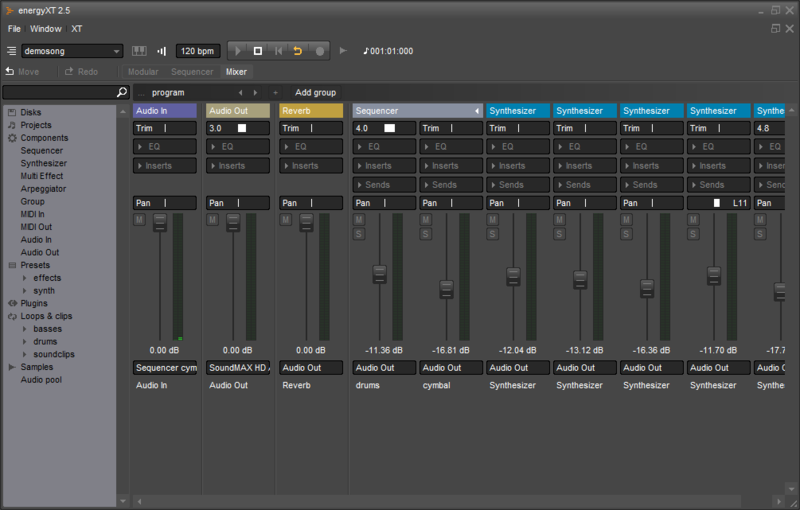 Very simple, intuitive audio parts management (stretch, volume, tune, transpose, cut, split, glue, fade in-out, x-fade). unlimited sample pads (with inserts per each pad). huge collection (30+) of sampled rhythm machines (Roland, Korg, Akai, Alesis ...) - from small to huge w. up to 180 drum sounds. inserts and sends on each pad. sampler playback functions (transp., filter, chop). strong PM synthesizer w. good sample player. quite some quality presets, samples and loops available on the product website. simple automation interface and support for automation recording from VST GUI. each track with integrated EQ. User friendly built-in theme editor, for nice colors and quite some custom themes available online. Complete set of customizable keyboard shortcuts. I just tried to list some special features that are really well implemented and distinguish EnergyXT in the huge DAW world. What was once a secret weapon inside the vst/midi arsenal (I was a power user of version 1) has become with version 2 something that I wouldn't call the dignified successor. While version 1 always left the feeling of already being somewhere near to completeness (despite the couple of bugs that always seemed to appear after a beta update), now XT2 leaves me pretty much left with only a select few of the features of V1 (needless to say there's no backwards compatibility), and overall disappointment. The modular area is quite poor and misses almost all the little tools that made it quick to get something going. The sequencer on the other hand got an impressive overhaul but still feels like there needs to be done a lot more. A lot of the intuitivity of V1 got lost somewhere in the development process. Positively remarkable is the new cross-platform orientation. Now not only Windows but also Linux and Mac OSX are supported. Nevertheless, this additional work seems to also be negatively reflected in the quality of the software which differs greatly between platforms. In general, bugfixing and support has come to crawl compared to "the old days". Hardly any sign of the developers and the (also in the licence mentioned) community support is (compared to the XT1 days) non-existant. The patience for the promised compatibility to version 1 projects is running low on power. Maybe the aim of the energyXT project changed in the middle of the progress ? I wouldn't know. I'm only sporadicly checking for any news for it nowadays. Maybe the deal with Behringer will bring a bit more wind into the sails of XT software again. This is without a doubt the best sequencer for your money. It's gorgeous UI is inspiring. It sounds better than cubase. I'm getting a great clear sound. There are a TON of features and there is a new version, XT2, on the way!. I found XT easy to learn since I also use synthedit, alhough video tutorials are available, can't beat that. There is also a dedicated forum for help which usually is quick. For what energyXT does there is no better deal out there. energyXT is also a lot more stable than cubase on my system. I wont penalize for presets because I really don't believe it applies here. Energy XT! The name caught my attention some time ago, but never really cared to download and try the app. I was looking to learn a new host just to have something different to work with other than my regular pattern based host. I downloaded the demo for Energy and was truly surprised at how well this little (small download size) application works. I had never worked within a modular enviroment and this program impressed me so much with its flexibility that I bought the license the same day that I tried the demo. Within minutes I had figured how to set up a basic template for working in a more linear way which was what I was looking for as oppossed to the pattern based way used in my other host. Many will look at the main window and wonder why there is no "standard" sequencer or a regular mixer or more presets (actually there are many of those in the user forum). But I find this to be EXT`s main strengh. You can make it anything you want! EXT can be an amazing modular enviroment in which to display your keyboard controller prowess and chain many different components (Comps in EXT lingo ) included audio and MIDI comps and trigger them at will.Or a regular linear sequencer, or a live machine! Your imagination and talent are the limit. You can also use EXT as a VSTi within you prefered host and tear down any barriers you host might have. The program itself is rock solid and I have never had any crashes even though I always use the latest Beta. Jörgen the developer is also a one-of-a-kind half human/half robot type of person as he develops newer features faster than the user base can think of. He listens to every request and exchanges views on how to make the program more stable and useful to us. The documentation is almost always lagging behind, but what can you expect of a program that has newer features implemented almost on a weekly basis? Still. Users like Darkstar, Caleb and others (sorry if I forgot anybody`s name here ) are always developing the docs and helpfiles to keep up to date with Jörgen. The GUI is another great feature as it can be fully customizable to fit your personal taste. Proof of that are the many skins available in the user database and wikis developed by the users. For the money. This is one hell of a program and I bought it as quick as possible as there is not any other program that costs this amount of money and yet can become so many things to so many people. Well i bought this beauty 1.5 Months ago and it is one of the best buy i have done regarding music sequencers. The Customer support is awesome since Jorgen listens to all of the request regarding the software. And all the features you get with it is also superb you does´nt only get a midi/Audio Sequencer, but also an arpeggiator,Groove, and chord player + a great sampler with excellent sound quality, and a synth wich can be downloaded at his site. 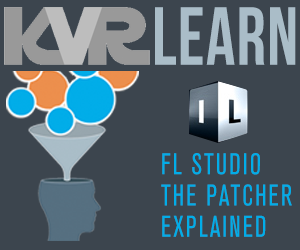 And if you are´nt ready to use it as your host you can also use the vst version of it inside the host you use. There is not any presets included in the sequencer, but you can find most of them thru the Energy XT forum on this site, and also remember that Ext is also totaly skinnable so you can add the look of your choice. And when it comes to new features and updates i really don´t know what to say (that guy is fast as hell).